BinaryOptionsRobot is one of the first binary options software systems to provide users with an entirely web-based interface that allows for more user control than other software. Traders can set their own risk levels and make other adjustments to fit their style. These features give the software a score of 85/100. More of the binary options brokers whose platforms work with this software allow the use of bonuses in the trade process, attracting a score of 70/100. Customer support is provided to users of the software via live chat, email and telephone, but prospects and visitors are only allowed the use of the contact form. This is why a score of 70/100 is applied. Then there is the issue of what can be traded. For offering trades on the Call/Put trade type, a score of 80/100 is applied. Generally speaking, the BinaryOptionsRobot has good ratings among its peers in the industry. BinaryOptionsRobot which is an automated algo robot that can trade on the user’s behalf is able to offer traders one thing that most other robots cannot: the ability to adjust settings to fit the trader’s style and risk appetite. Many other robots simply trade without the user having any input as to how the robot works. Why should a trader supply the money and yet not be able to determine how the money is put to work? BinaryOptionsRobot addresses this problem. Once the software is activated, it becomes possible to adjust the settings to any of these listed parameters. Equities: IBM (US), MICROSOFT (US), APPLE (US), CITI (US), COCA COLA (US), GAZPROM (RUSSIA), HSBC HOLDINGS (LONDON), LUKOIL (RUSSIA), NIKE (US), SBERBANK (RUSSIA), TATA MOTORS (INDIA), TESCO (UK), AMAZON (US), GOOGLE (US), FACEBOOK (US), TWITTER (US), EBAY (US), ALIBABA (US), MCDONALDS (US), WALT DISNEY (US). Indices: BOMBAY SE, DAX (GERMANY), DOW (US), DUBAI, FTSE 100 (UK), HANG SENG, KUWAIT GENERAL INDEX, MICEX 10, NASDAQ (US), NIKKEI 225 (JAPAN), RTS, S&P 500 (US), SSE 180 (SHANGHAI STOCK EXCHANGE), TADAWUL, TEL AVIV 25, TOPIX. Commodities: Oil, Gold, Silver, Platinum, Wheat, Coffee, Sugar. The account type you have, will determine the features of the robot that are accessible to you, as well as the level of support from the customer service that you get. VIP account is provided to all beginners with the BinaryOptionsRobot service and is available for one month thereafter. Traders will then be able to continue using the VIP account status on fulfillment of certain conditions as mandated by the account managers. BinaryOptionsRobot is optimized to operate on mobile devices. Apart from being able to use the robot interface on a smartphone or tablet device, the software can be used on the mobile apps of the various binary options brokers whose platforms are used in the trading process. This makes BinaryOptionsRobot a very good choice when it comes to mobile trading. Credit card/debit card: This provides an immediate deposit for the BinaryOptionsRobot to work on. It is not available to all traders as some countries do not have access to this option. Also, the individual brokers stipulate who can use credit/debit cards and who cannot. The bank wire transfer method takes between 3-7 days for funds to clear. This is a secure method, but does not make funds immediately available for the BinaryOptionsRobot to trade. It is available to all users and has the advantage of not having any limits to what amounts can be transferred or withdrawn. E-wallet options: The digital wallets available to users will depend on what each broker offers. For instance, Bloombex Options permits its traders to deposit and withdraw with Skrill. Recently, Qiwi, iDeal and Yandex Money were added as one of the methods that could be used on some of the compatible brokers. Here is a list of the minimum deposit amounts in the various base currencies that feature on BinaryOptionsRobot. After signing up with the broker and making the deposit (minimum of $250), the BinaryOptionsRobot software can be adjusted to any of the four risk settings mentioned earlier, then switched on for trading. Customer support on BinaryOptionsRobot is a bit discriminatory. The only customer support channel available to prospects and visitors is an online contact form. However, those who have subscribed to use BinaryOptionsRobot are provided with an email address and a phone number. In terms of the quality of customer support on BinaryOptionsRobot, the verdict is just at par with industry standards. BinaryOptionsRobot presents some extra features not usually found on other binary options robots. Some of these are listed below. BinaryOptionsRobot comes to traders free of charge. You can choose your own risk management settings. This will control how the robot trades on your account. A new feature is the ability to follow the team on social media (Facebook, Twitter and YouTube). In terms of performance, BinaryOptionsRobot performs better than most other robots in this market. This is in no small way related to the fact that traders are able to adjust the settings to match what they want on their accounts. BinaryOptionsRobot provides the trader with sound alerts of when a signal is detected. BinaryOptionsRobot comes with an automated trading feature, as well as a signals-only feature (which requires manual confirmation and execution). BinaryOptionsRobot uses mostly EU-regulated binary options platforms. The only way to contact the BinaryOptionsRobot team is via the online contact form. This is too restrictive and does not allow for personalized customer service; something that today’s binary traders desire. Is BinaryOptionsRobot available to US traders? BinaryOptionsRobot is not available to US traders. Is BinaryOptionsRobot available to Canadian traders? BinaryOptionsRobot was recently made available to Canadian traders. How much do I need to pay to use BinaryOptionsRobot? The BinaryOptionsRobot software is free to use. You only need to make an initial deposit of $250 with one of the listed brokers. You fund and withdraw your profits as the software works on your account. 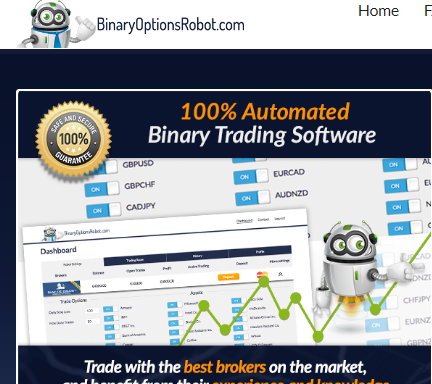 BinaryOptionsRobot is legit, and also optimized to work with platforms of regulated binary options brokers. I am a beginner. Can I use BinaryOptionsRobot? You do not need to be an experienced binary options trader to use this software. Set the risk level that you are comfortable with so you can achieve the best trading results. BinaryOptionsRobot doesn’t require any downloads, or plug-ins. It runs from your web browser. Can BinaryOptionsRobot trade if I am offline? BinaryOptionsRobot only trades when you are online. Does BinaryOptionsRobot have a mobile app? Yes, Binary Options Robot Mobile App is available for Android on the Google Play Store. How do I place a trade with BinaryOptionsRobot? You can use the Auto Trade Approval setting to accept or decline the trade that pops up on your dashboard, thus giving you absolute control over your account.